After having a fair idea about what The Bridal Saga is, let me now tell you about its first part - The Bridal Masterclass which was held at ITC Grand Central in Lower Parel and honestly we couldn’t have asked for a better event host! The day started with Mumbai’s top makeup artist Arshis Javeri interacting with all our 100 brides-to-be. He took all the makeup related queries of our brides and made sure each and every one of them was answered. Not only this, he also selected 3 girls from the audience and transformed them into 3 beautiful brides right in front of our eyes. Now, what’s better than seeing a complete Bridal transformation, from looking like a regular girl to a complete glammed up bride? The 3 looks that he created were - night wedding, day wedding & cocktail / engagement look! Our first bride-to-be, Namrata here is seen wearing a stunning all-red Sabyasachi kalidar velvet lehenga from Flyrobe . It comprises of a lehenga-skirt paired with a heavily embellished blouse with a sweetheart neckline and sheer dupattas having floral buttis all around & an intricate border embroidery of thread and zardozi. The look was completed with heritage jadau necklace set handcrafted in 22kt gold with polkis, south sea pearls and semi precious emeralds from VelvetCase. 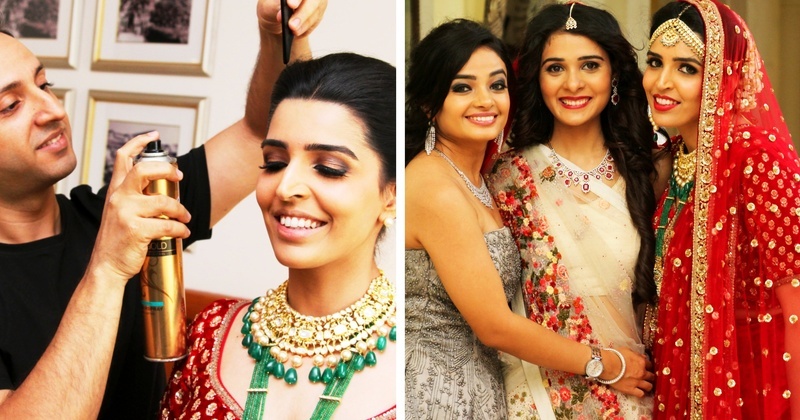 It was layered with a long emerald necklace with a beautiful polki pendant and a polki matha patti adding to the traditional look of the bride! For her makeup, Arshis opted for a night makeup look, medium smokey eyes and a pop of red on the lips. Our second bride, Priyanka here is spotted in a grey Shantanu and Nikhil off-shoulder ball gown in taffeta base embellished with all-over bead and cutdana embroidery from Flyrobe. This look is apt for your engagement or cocktail ceremony. We completed her look with a modern and contemporary designed necklace set crafted in silver and studded with Swarovski stones from VelvetCase. For her makeup we decided to go for dark smokey eyes, natural lips and dramatic messy curls. For the third bride, Pranali we chose an ivory base Varun Bahl lehenga with floral red and golden thread embroidery on it from Flyrobe. The look was completed with a second dupatta of contrasting colours! For her jewellery, a necklace set crafted in 18kt gold, studded with precious diamonds and rubies was selected from VelvetCase. For any bride who wants to be subtle but yet make a statement, this is a great choice! Arshis kept a subtle day-makeup look on her, with red lips, strong brows and open wavy hair. The day then proceeded to high-tea with all our brides enjoying some scrumptious snacks from ITC Grand Central and from the looks of it, they savoured every bite of it! With this, the day came to an end for The Bridal Saga, S1’s Masterclass. Well, this was just the first part of the Saga. The second part was more fun & interesting, specially for the couples as we gifted each of these 100 couples a FREE pre wedding shoot with the top photographers and gift hampers worth Rs 1 Lac! Well, after all this, if you are disappointed that you could not be a part of this, don't you worry, because we are coming up with Season 2 very soon this year. And it's only going to get bigger & better! Luxury Venue Partner - ITC Grand Central.